The low-profile Hipster belt features multiple pockets and keeps essential items snug and secure around your waist, and stretches to fit your individual contours. The Hipster Racer Waist Belt with Pockets is rated 4.6 out of 5 by 29. 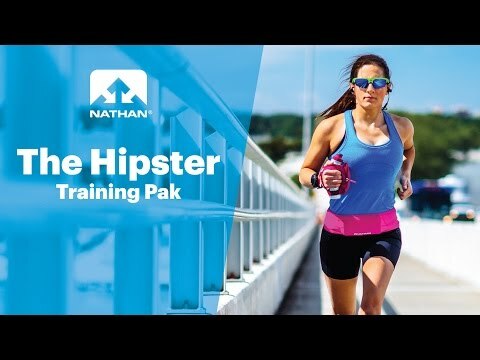 Rated 5 out of 5 by Sarah from Doesn't Budge I very, very rarely write reviews- but I love this running belt so much that I felt I owed Nathan Sports the courtesy. I wear my belts on my hips, just above my bum, so in the past I have had problems with them (Velcro belts, buckle belts, I've tried them all) creeping up my waist, especially if it contains my phone; this belt stays locked in place, doesn't budge at all, not even running up hills. It has managed to stay put no matter what material shorts I'm wearing, which is amazing. I can't even feel the weight of my phone in it. You also can't beat the price!!! For size reference, I wear a size 4 & ordered a size small & it's a perfect fit. Rated 5 out of 5 by Trinity S. from I love this belt! I bought this belt to hold just my car keys and empty dog poop bags but recently took my Samsung galaxy phone and 2 sets of keys. There was plenty of room for both and I didn't even feel the extra weight or bulk of the extra items! I love how it holds my pants up since I have a little bit of a tummy my pants sometimes roll down if when I bend over or while running. I love this belt so much that I bought it for my sister in law who just started running as well! Rated 5 out of 5 by Javarunner from Extremely comfortable vs buckle versions Highly recommend this belt! I've had a couple of different belts with buckles. Always felt like they would loosen over a few runs, and I would have to make them very tight if I wanted to add on a hydration holster. Have run with this a couple of times now, almost don't even notice that it's there. I thought having to step into and out of the belt would be awkward, but not a problem at all. Large pockets accommodate my oversize cell phone (LG V20) just fine. Low profile pockets, so it doesn't feel bulky on the waist at all. Rated 5 out of 5 by jamie z. from pockets 4 dayz it's an actual reported fact that women's clothing is generally made with less pockets than men's clothing. (isn't a patriarchal society fun?) that said, whether i'm embarking on a long run and need the extra space to store gels, or if i'm just walking the dog and need a pocket for my phone and keys, this belt provides me the pockets i never had so i can store stuff on my person. great material - i think it will wash well. it's very comfortable and stretchy. for reference - i'm 5'6", about 110 lbs, generally wear xs in workout bottoms and 0-2 or 24-25 in pants, and i ended up keeping the size xs for this belt. it hugs comfortably just below my natural waist. if you want this to be hip-level as opposed to waist-level i'd suggest sizing up. also fantastic clearance price! can't beat it. on sale or regular price, you can't go wrong with nathan products. Rated 5 out of 5 by Anonymous from Half Marathon Tested and Approved! Just used my Hipster Waist Belt for a tricky, hilly, sweaty half marathon and it was excellent. It held my cell phone (iphone 7 plus), car key, and a package of energy chews and nothing slid around or moved. Best of all - no chafing! Would def recommend. Rated 4 out of 5 by Martha G from Nathan waist band It was definitely better than holding my phone while running. It kept the weight centered. The band did slide up while I ran, but once I worked up a sweat the band stayed in place. I recommend people buy a band that sits higher than the waist. Maybe belly button area or higher, to prevent it from sliding. However, IÐ²Ð‚:tm:m pretty impressed with the product. Rated 5 out of 5 by josh w. from Super comfy / stays out of the way Perfect belt for carrying my big-A iPhone 7+. I forget itâ€™s even there! But really the best feature is that it causes no chafing whatsoever (I wear it under my shirt). Unfortunately I canâ€™t say that this is so for most waist belts. In fact, much pain and literal scars have resulted from a competitors belt. Rated 2 out of 5 by K D E from Poor Quality I bought this 3 months ago and it’s coming apart at the seams - literally! I expected so much more from a Nathan product. Very disappointed! !